Please login to theowner portal. If you cannot find what you’re looking for in the portal, call us at 707.444.3835. Please login to thetenant portal. If you cannot find what you’re looking for in the portal, call us at 707.444.3835. What on Earth do I do if my CO detector goes off?!? Turn off appliances, or other sources of combustion at once. Immediately get fresh air into the premises by opening doors and windows. Call out 24 hour maintenance hotline – we will send a qualified technician and have the problem fixed before restarting appliances. If anyone is experiencing symptoms of carbon monoxide poisoning such as headaches, dizziness, vomiting, call the fire department and immediately move to a location that has fresh air. Do a head count to be sure all persons are accounted for. Do not re-enter the premises until it has been aired out and the problem corrected. 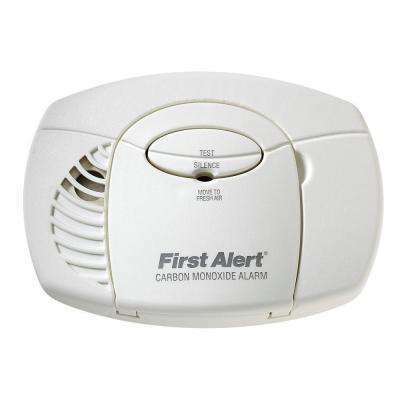 -Gas or oil furnaces are frequently the source of carbon monoxide leaks. Measure concentrations of carbon monoxide in flue gases. Check all connections to flue pipes and venting systems for cracks, gaps, rust, corrosion or debris. Check the filters and filtering systems for dirt and blockages. Check the combustion chamber and heat exchanger for cracks, holes, metal fatigue or corrosion. -Check furnace flame, burners and ignition systems. 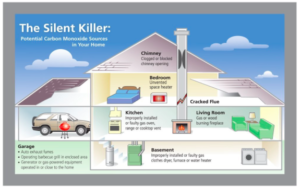 A predominately yellow, flat, lazy-looking flame in a natural gas furnace indicates fuel is not burning efficiently and is thus releasing higher than usual levels of carbon monoxide. Oil furnaces with a similar problem produce an ‘oil’ odor, but remember you can’t smell, see or taste carbon monoxide. -Chimneys and venting systems must be carefully checked for blockages caused by debris, animal nests, cracks, holes or cave-ins. 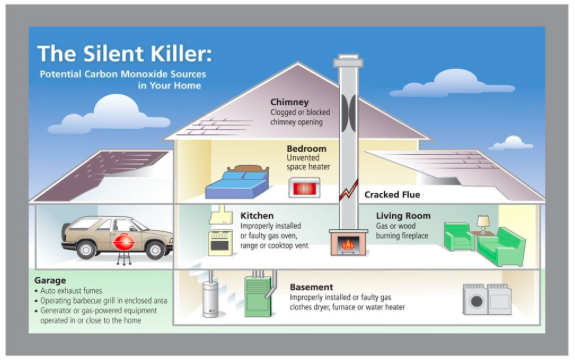 A blocked chimney or venting system can force dangerous gases back into your home. -Venting and fan systems on all fuel-burning appliances must be inspected for proper installation to assure carbon monoxide is vented out rather than in. Don’t forget gas water heaters, clothes dryers, space heaters or wood burning stoves. -Inspect fireplaces for blocked or bent chimneys or flues, soot and debris or holes in the chimney that could release carbon monoxide exhaust back into the home. -Stove pilot lights in a closed-up home can be a source of carbon monoxide build-up if not operating properly because they are not vented to the outside. Check to be sure they are operating properly. -Fireplace pilot lights can also produce carbon monoxide and should be checked regularly. -Never burn charcoal inside no matter how much you want to recapture summer and never use your gas stove as a heater. Keep the oven door closed and use it for cooking only. -Never leave a car running in an attached garage even if the garage door is open. For more information on carbon monoxide detectors, please visit carbonmonoxidekills.com. Please login to the owner portal. If you cannot find what you’re looking for in the portal, call us at 707.444.3835. Please login to the tenant portal. If you cannot find what you’re looking for in the portal, call us at 707.444.3835.